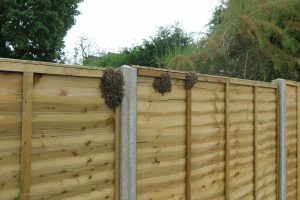 I watched a cast swarm emerge yesterday and debate on which side of a newly installed fence they should hang up. First of all, they flew high above the garden looking as if they would depart high up in a birch tree where a previous swarm had landed. So, I thought I would try hanging a Vita swarm lure on the clothes whirlygig in the garden. Immediately the garden air was suffused with the beautiful scent and soon afterwards the bees did indeed descend back into the garden, flying lower and lower until they finally settled on the garden fence. But which side of the fence? The debate went on for about 30 minutes until they decided on the shady west side (it was 11am). At one point I even saw the queen marching along the top of the fence (but sadly the photo I rapidly took of her is grossly out of focus). 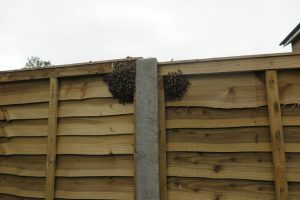 The bees are now safely re-homed and I’ll be trying the Vita swarm wipe as a last-minute lure next time I see a swarm. And I’ll be hoping that the fence will become the favoured place to hang out!